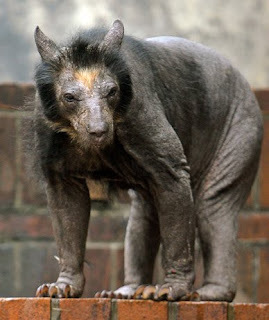 A Spectacled Bear named Dolores (pictured above), which is resident in Germany's Zoo Leipzig, is going bald. Although not believed to be life threatening, Zoo experts are working to cure the bears' unfortunate condition. Spectacled bears—also called Andean bears—live in the mountains of South America and are the continent's only bear species. However, this is not the first time this has happen to a spectacled bear in captivity. Keepers in a zoo in Ecuador cured an affected bear there by feeding it a natural diet of fruits and bamboo and by providing added enrichment items, such as toys and exotic foods, into the bear's enclosure. Four months later the fur grew back. Hopefully Dolores and her friends will soon have a full coat of fur too. For more information on the spectacled bear (and to see what they look like with fur) click here.